The Power Station once dominated the village and was the landmark by which Willington is most often characterised. This is a brief summary of its history. 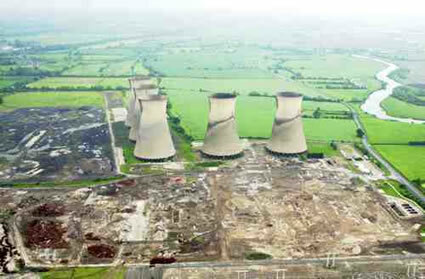 Willington Power Station was, in fact, two almost entirely independent generating stations situated on the same site. With separate management and staff, the few facilities they shared amounted to the coal and water supply. The two stations were designated, logically, Willington "A" and Willington "B", the former occupying the part of the site closest to the A5132 (although then known as the B5009). In the post-war years Britain saw a sea change in the way electricity was produced. The National Grid had been devised in the 1920's and this allowed the removal of comparatively small 'town' generating stations to be replaced with purpose built establishments, linked together to deliver power wherever it was required. While the location of the customer was no longer a high priority in siting a power station, ready access to raw materials of fuel and water certainly were. The Trent valley, with its obvious water supply and proximity to the Nottinghamshire & Derbyshire coal fields - which were then though inexhaustible - was an ideal choice. An extensive, although already clogged, railway system was also on hand to move the coal from pit head to power station. Small, previously unheard of, villages and hamlets became well known landmarks; High Marnham, Staythorpe, Radcliffe & Drakelow to name a few. Willington was one of them too. The beginning of 1954 saw the bulldozers move onto a 286 acre area of pasture land, a small covert and boggy, unused scrub between the B5009 and the Derby - Birmingham railway. 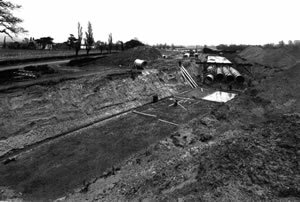 No buildings were at peril - at least not yet - but Marples, Ridgeway & Partners Ltd, the company responsible for site clearance, foundations and the railway works, had a long job ahead of them preparing the site - especially the boggy land which was to form the railway marshalling yard. Thousands of tons of sand were tipped to build up the ground away from the water table. The consulting engineers Ewbank and Partners were responsible for the design, engineering, construction & commissioning of the "A" station with a legion of sub-contractors being tasked with the multitude of disciplines required in building such a station. The "A" Station comprised four generating Units, each of 100 megawatt capacity. To service these, a pair of 425 foot chimneys (each reportedly amounting to 5,000 tones in weight!) were provided, along with just two cooling towers. Hailed as a revolution of the time, the design of the "A" Station was of four "semi-outdoor" boiler units, only the burners and steam drum of which were enclosed, arranged in a square formation. The outdoor part of the design was indicative of the austerity of the period, by restricting the cladding around the boiler areas to a minimum significant cost saving were achieved. The design, however, was not popular with the staff who had to brave the elements all year round. 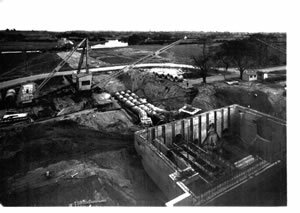 Even as the "A" Station was still taking shape in early 1957, the Central Electricity Authority were exercising their statutory powers by applying to the Minister of Power to extend the Willington Generating Station with a second section to be known as "Willington 'B'". The "B" station was to comprise of only two Units, albeit each of 200MW capacity - equalling the output of the "A" Station with half the hardware. Only one 425' chimney was required for the "B" Station but three cooling towers were provided. Of course the cooling towers are the largest and therefore most distinctive features of an power station. The three structures provided for the "B" station were set at right-angles to the north of the pair for the "A" Station. The towers are 300 feet high and have 145' diameter at their tops, 122' at their "throat" and 218' at the base. Each tower had an effective cooling surface of 858,000 square feet. By the end of 1957 the "A" Station was nearing completion. The construction had not been without its cost - three workers lost their lives in falls, a hazard faced daily by the transient population of builders who moved from site to site on this work during the 1950's and 60's. The first Unit of the "A" Station was commissioned on 17th December 1957 with Unit 4 bringing the station up to full operational capacity on 10th July 1959. An official opening ceremony was performed on 2nd October 1959 by the 11th Duke of Devonshire. Such was the demand for electricity (calculated to be doubling every ten years at that time) the capacity of the four Units of the "A" Station were up-rated to 104 megawatts. The net effect of this was to significantly reduce the spare capacity of the station - meaning the plant had to be driven hard almost all the time. Once Units 5 & 6 in the "B" Station came on line a few years later, the whole site settled into its work-a-day job of providing electricity to the adjacent National Grid sub station. The water for the cooling towers being sucked out of the Trent to cool the steam prior to its return to the river (the same water probably went through the process half a dozen times before it reached the Humber!) meant that the Trent in the area had a somewhat higher temperature than it would naturally, thus making for excellent fishing. "I served my time as an electrical fitter at Willington from 1965 to 1969 and remember that the exciter on one of the B station units no.6 I think (the one on the left as you looked out of the workshop window towards the coal plant) had burnt out and was going to be away for repair for many months. Someone Don Eddison I think came up with the idea of using a diesel loco to supply the excitation for the unit. The links from the loco generator to the shunt drive motor were removed and cables were run to the alternator excitation terminals. A set of loco controls were installed in the plant control room to allow raising and lowering of the speed of the diesel and thus the excitation. The loco was actually moved 2 inches per day back and forth to prevent brunelling of the wheel bearings.I seem to remember someone calculated by the amount of fuel used and the average revs of the diesel that the loco would have traveled twice around the world had the loco been in normal service. The loco was called THE ROYAL PIONEER CORPS. I think it was a D class loco. I had my picture taken on the footplate which later appeared in the company news paper that used to be called the Power News." Coal for the boilers - a million tons a year, just for the "A" Station - found its way into the railway sidings, through a specially constructed connection at Stenson Junction. The 19,000 yards of sidings could store wagons containing 7,000 tons of coal. The Central Electricity Generating board, as the nationalised industry had become known, owned two 204hp diesel shunters for moving the coal wagons from the yard into the coal tipplers - where a chain 'beetle' would drag the truck in then back out after it had been tipped onto its side and its contents emptied onto a conveyor. Coal was either fed straight into the station bunkers or stacked on a large area of ground to the north of the site - almost over shadowing the nearby Findern primary school. 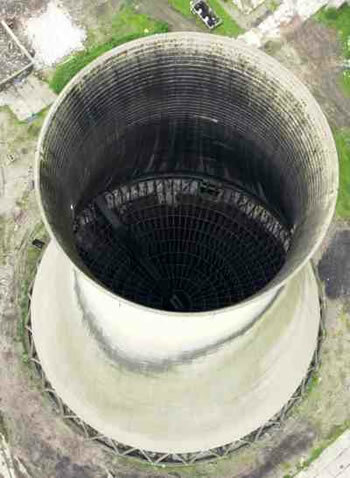 A largely overlooked waste product of power station operation is ash from the boiler. In the case of Willington, the geography of the area was fortuitous in that gravel extraction from the alluvial flood plain of the Trent was (and still is, of course) widespread. Thus there was a readily supply of large holes in the ground in need of filling in. the trouble was that the majority of the gravel extraction of the time was taking place on the other side of Willington village, closer to Burton. The solution, rather than transport this ash by lorry through the village - with the attendant nuisance that would create - was to build a pipeline. This prominent feature was buried underground through the village, but otherwise snaked its way along the south side of the railway - with the need for ramps and ladders wherever public footpaths encountered it! Although a generally successful method of transporting the ash, it was not without its problems. Around the point the pipeline disappeared underground a house called Ivy Cottage stood. This was the first building on the left after passing under the railway bridge on Twyford Road. Despite significant efforts by the CEGB to cure it, this section of the pipeline was troubled by considerable vibrations - with consequent nuisance, and even damage, to the nearby house. The solution was that the CEGB bought the property and demolished it. 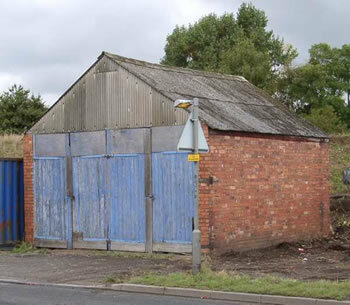 The detached garage of Ivy Cottage survived until 2002 before being demolished to allow a new house to be built on the site. Perhaps as a testament to the solid nature of the work the power station achieved, there were few notable events. The "big freeze" of 1962/63 was to place great strain on the system - with the link between the station and the National Grid freezing and tripping out - leaving the station "all revved up with nowhere to go" - an undesirable state of affairs. Even the coal in the railway wagons was frozen solid, so that when they were tipped upside down to empty them their contents remained fast! In 1973 the "A" Station won a CEGB award for its exceptionally high availability during the winter - 98.56 per cent. The 1980's was to prove a significant decade. In 1981 British Rail introduced a new system for handling the coal delivered to power stations. The practice of bringing wagons of coal to the power station for the CEGB to empty them into their tipplers at their leisure was inefficient - as was the reverse procedure at the collieries. The solution was the "merry go round" system where a fixed formation of coal hoppers would shuttle back and forth between colliery and power station being loaded and unloaded via 'drive through' bunkers in a heavily automated process. At a stroke, therefore, Willington's eleven through sidings used to store coal wagons until they were needed became redundant - as did the two shunting locomotives. Whilst most of the sidings were soon torn up and taken away, the shunters remained on site - apparently seeing little or no use in the later days. The miner's strike of 1984 saw railway deliveries of coal suspended for the duration. A token picket line of welsh miners under the railway bridge at Findern (referred to as the picnickers at the time, such was the laid back nature of their presence!) was sufficient to prevent the railway unions from delivering. Lorry drivers had no such compunction and coal stocks were maintained by a procession of 30 tonne tippers. Given this was before the A50, it pushed the capacity of the A5132 to its limit. Several open days were held at the power station during the 1980's and were always immensely popular with locals and not-so locals alike. Visitors from far and wide - including tv crews and press photographers - were attracted to the cooling towers. All to crane their necks and peer through binoculars at a pair of nesting peregrine falcons. Apparently, to a falcon, a nesting box high up on the side of a cooling tower is a more than adequate substitute for a remote cliff face. 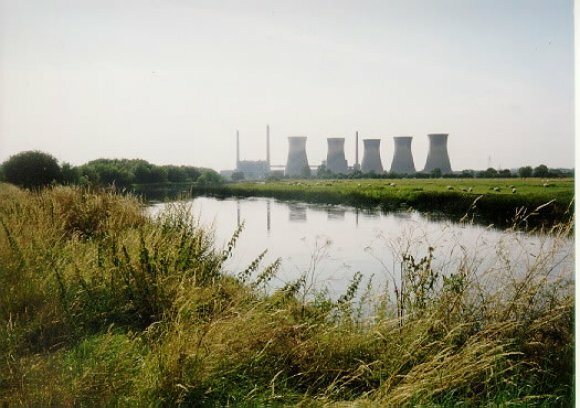 Arguably, the Beginning of the End arrived at Willington on 16th August 1989 when Privatisation saw the power station become part of National Power PLC. Ironically, this event was heralded with bands and fireworks. Without getting too political, the crux of privatisation is that there is no stone left unturned in the pursuit of a profit. If an asset is weak it will be cast aside with thought only for its scrap value. 27th January 1993 saw Unit 3 of Station "A", having the highest hours at 179,579, shut down, followed a few months later by Unit 4 with 174,343 hours. 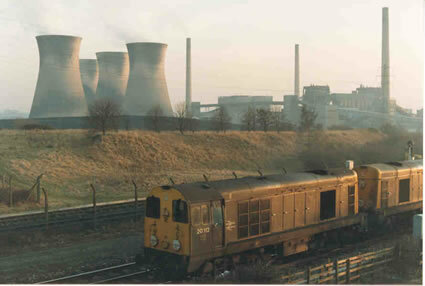 At this time, the station was operating on short term contracts selling its electricity to National Grid PLC at fixed prices - but this was only a short term expediency until National Grid could upgrade their installation at Willington to allow it to operate without input from the adjacent generating station. Another clue to this policy is available in the Internet from the Office of Electricity Regulation ("Ofgem") - the Government's means of keeping some control over the once Nationalised industry. This wordy document, in a nutshell, illustrates that as a condition of its licence, a private electricity generator must justify why it wants to close a generating unit - more specifically, why a competing company can't take it over, such are the priorities of privatisation. 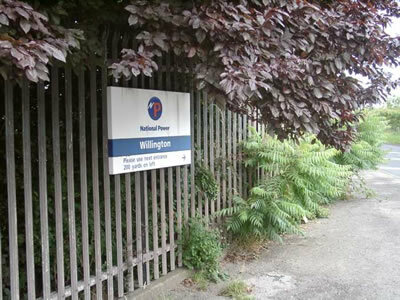 Thus, in September 1997, National Power notified Ofgem of their intent to close Unit 5 at Willington, leaving just Unit 6. It was reported that Units 5 and 6 had operated for 162,000 and 161,000 hours, respectively, being due for a major overhaul in 1998 and 1999. Their case was strengthened by the fact that Unit 5 had "suffered extensive damage to the HP/IP turbine which has adversely impacted on both capability and thermal efficiency and hence economic viability of the unit " (NP 30 September 1997). Ofgem appointed a company of independent assessors to investigate National Power's plans - and it is this report which is publicly available. The assessor performed a series of complex calculations based on a cost/benefit ratio and concluded that "the closure criterion is generally satisfied for Unit 5. The closure of the power station was not proposed by National Power; but we conclude that the closure criterion is generally satisfied for the whole power station". So did National Power intend to close the whole site? Probably not, the assessor's concluded; "National Power appears to be resisting closure of the full station in favour of closure of the unit that requires imminent overhaul. National Power's case for the closure of only one unit appears to be based mainly on the availability of constraint payments for the remaining unit. However we believe that these payments are unlikely to materialise. The reluctance to propose full closure of Willington Power Station may relate to a strategy to retain ownership and operation of the site, and thereby to deny the site to other users and, in particular, a competing generator". It was also revealed in this report that National Power had recently bid for and acquired a 72 per cent shareholding in Hazelwood Power Station in Australia. The Hazelwood generators were reportedly in poor condition compared to those at Willington and a part of the success of the bid to run the Australian power station was the identification of the use of the Willington Unit 5 AEI Generator. They therefore intended to ship the generator stator and rotor from Unit 5 to Australia to provide spares cover for Hazelwood's needs. Consequently the end of Willington was in sight. Unit 5 was allowed to close as proposed on 31st March 1998, leaving just the sixth and last unit to struggle on. 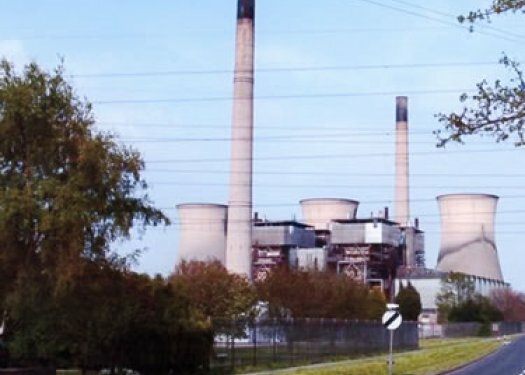 By now down-rated to 188Mw, Unit 6 took its turn to be de-synchronised a year later on 31st March 1999 - thus ending the 41 year, 3 month & 14 day history of electricity generation at Willington. Demolition commenced later the same year - in November 1999. A specialist company called Abel Ltd wining the contract. By now the site was the property of Innogy Holdings PLC - whether by amalgamation or takeover, this is what National Power has become. XHTML 1.0 validated. WCAG compliant. Page generated in 0.1438 seconds.